As a bustling metropolis in a prime, centralized location, San Antonio is fast becoming home for all kinds of companies around the world. If you hire forklift drivers in San Antonio, you’re responsible for forklift certification. Let employees know you want to train them for forklift jobs at your facility! – sign up and get your safety program up to speed! The majority of forklift-related accidents that happen every year are caused by untrained operators. This means that forklift training San Antonio is the most effective way to prevent injuries and fatalities, and impress employers. If you are a business owner and have been operating your company without the proper certifications, you are running the risk of accruing unnecessary fines. 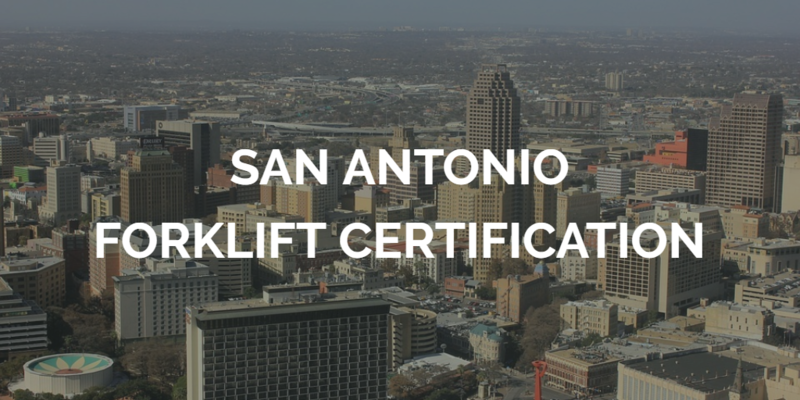 Having proper forklift certification in San Antonio will also help you to find better opportunities, more business, and more customers in your industry and area! Let us at Forklift Certification help you get your San Antonio forklift training and certifications today. • Train a Trainer – looking to become your company’s main OSHA resource? Look no further than out Train a Trainer class, perfect for anyone looking for forklift certification in San Antonio, TX. • Training Kit – from rookie forklift drivers to experienced operators, this training class is ideal for those drivers who want to elevate their chances for forklift jobs in San Antonio, TX. • Bundle Package – why settle for one option when you can have both of our forklift certification classes in San Antonio, TX? With the Bundle Package, you’ll get our Train a Trainer course and Training Kit. This is the best possible value for forklift training classes in San Antonio! Nobody beats FLC for comprehensive OSHA training in San Antonio, including the tri-county Bexar, Medina, and Comal region of south-central Texas. When your employees receive San Antonio forklift certification from FLC, everyone benefits. Your workplace becomes safer. The chances of accidents and injuries decrease. See what San Antonio forklift certification can do for your forklift fleet – call us today! As your employees gain the knowledge, training, and experience needed to properly handle forklifts, their confidence will increase. As confidence goes up, the productivity of your workplace will increase and add to your bottom line. In our forklift training curriculum, operators will learn about how to avoid accidents, and how to avoid the types of situations that are most at risk. Accidents are often costly and dangerous, but with proper forklift training San Antonio they are completely preventable. Not only will you get an increase in productivity for your business and a reduction of personnel accidents, but your business, its merchandise, and the machinery you own will be safer and better protected. Just as operators will be more aware of their surroundings, they will be less likely to make mistakes due to improper training that could result in the accidental destruction of the building, equipment, or merchandise. Plus, in the event of an accident, San Antonio forklift certification ensures that OSHA has the required training records. Compliance is critical – sign up for forklift certification in San Antonio today! OSHA is looking out for the safety of your employees and customers. If they find unsafe working conditions and the lack of paperwork to prove any forklift certification in San Antonio, you will be fined until the situation is resolved. This is an easy risk to avoid by completing OSHA training San Antonio and becoming properly certified. With forklift certification in San Antonio, TX, your company is at less risk for OSHA fines and penalties, not to mention severe legal liability. Remember – the best forklift driver is a well-trained forklift driver and our forklift certification classes in San Antonio, TX are made just for that purpose! As an employer in the U.S., getting all your employees certified with their San Antonio forklift certification protects them from injuries and fatalities, and keeps your business productive with fewer accidents. If you hire forklift operators in your workplace, it is your responsibility to provide a safe working environment, and to ensure all operators have completed training and been confirmed competent to operate forklifts safely. San Antonio is a major logistics port full of opportunities for trained forklift operators. Some of the city’s top companies include AECOM, Atlantic Aviation, CIG Logistics, Fiesta Warehousing and Distribution Company, XPO Logistics, and Coca-Cola. Sign up for your forklift certification classes in San Antonio, TX today! Clearly, the benefits of obtaining your San Antonio forklift certification are great and virtually limitless. It can advance your career, raise your pay rate, and protect yourself and fellow employees. If something has so many practical and exciting benefits for your career, why not choose to invest in yourself? ForkliftCertification.com has put together all of these benefits together, into one convenient online program. Our forklift training San Antonio takes about one hour to complete, can be taken online where ever you have internet access, and will award you with certification the very same day. Our forklift training modules are 100% OSHA-compliant so you can rest easy knowing you are equipped with the most up-to-date information, and employers will love that you will help keep their workplace compliant and immune to fines and legalities. WHAT’S INCLUDED IN OUR SAN ANTONIO FORKLIFT CERTIFICATION PROGRAM? GET SIGNED UP WITH OUR FORKLIFT CERTIFICATION IN SAN ANTONIO TODAY! OSHA requires that all employees complete refresher training at least every three years, and re-certifications with us are always free. If you’d like to show others the importance of forklift certification in San Antonio, our Train the Trainer course is for you. You will be trained and certified to teach others how to operate forklifts and will perform the required evaluations to reward them with their certificate. It only takes a few minutes to set up an account, and to get started on your forklift training and certification in San Antonio. Do it now! If you have any questions about our forklift certification classes in San Antonio, TX, give FLC a call today at (888) 278-8896. You can also visit our contact page to send a secure message. Thanks for considering FLC for your San Antonio, TX forklift certification needs!